This week I nearly contributed to another kickstarter. It looks fun, its quick to play, easy to pick up, some cool artwork, a fantasy theme. Everything about the game looks to be a thumbs up from me except one thing. Unfortunately that would bring the total price to about $60-$70 when converted to AUD (I wanted the extras to have up to 6 players) and with so many games to buy and so little money.. I couldn't justify that kinda cash on a what is essentially just a card game. Also am still waiting to see what happens with the last two games I helped fund through kickstarter before I get too carried away.. But onto the week of gaming! Between Two Cities: 7 Wonders Lite Edition with the neat bonus of working with two players. Easy and fun but I think I'd rather just play wonders..
Pandemic Legacy: November month replayed and this time successfully beaten! Hope to finish off our last month on Monday night and get a win the first time around. 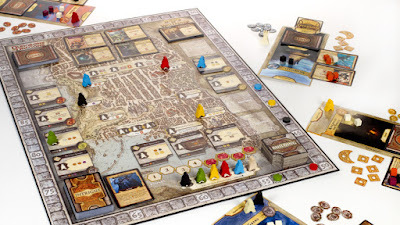 Lords Of Waterdeep - I've played Tzolkín (really enjoyed) and Stone Age (enjoyed) - but Lords Of Waterdeep is the first worker placement board game I own in my collection. Looking forward to introducing it to a group of friends who will be first timers to the genre!